Austin Pond Doctor is now offering 21 hour a day emergency pond service. 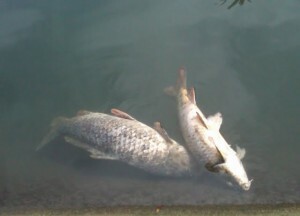 To many times customers have had prize koi fish die because the pump decided it was was time to quit. At times like this who are you going to call at 10:00 o’clock at night. Pond pumps don’t care what time of the day or night they decide to quit. Just recently 8-1-2012 we got a call in the morning about a pump not working, apparently the pump decided to quit working sometime in the night and by the time the home owner noticed it, 20 fish were already floating. The pump actually worked it was just clogged , the pond quality only left a few hours of O2 in the pond and really needed to be cleaned. 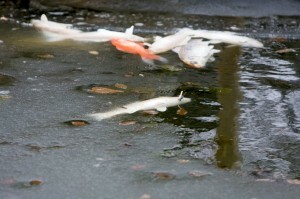 We rushed out and saved the remaining fish and cleaned the pond a few days later. If this was your pond and the pump quit you only have a limited amount of time before the floating begins. There is over $10,000.00 worth of prize koi in this pond, many are favorite pets of children and most likely have names. The rule being 1 inch of fish for every 10 gallons of water means that this pond has less than 10 hours of oxygen in the pond to supply the fish with enough O2 to survive. After the 10 hour mark this could be what happens. Once the first fish floats others will follow in just a matter of minutes. Large numbers of fish swimming to the top and gulping air at night or early in the morning. If disturbed they dive but quickly return to the surface. If oxygen depletion has not reached a lethal level, fish are at the surface in the early morning but return to deeper water as oxygen builds up during the day. This may continue for several days. The pond owner should take corrective action immediately. 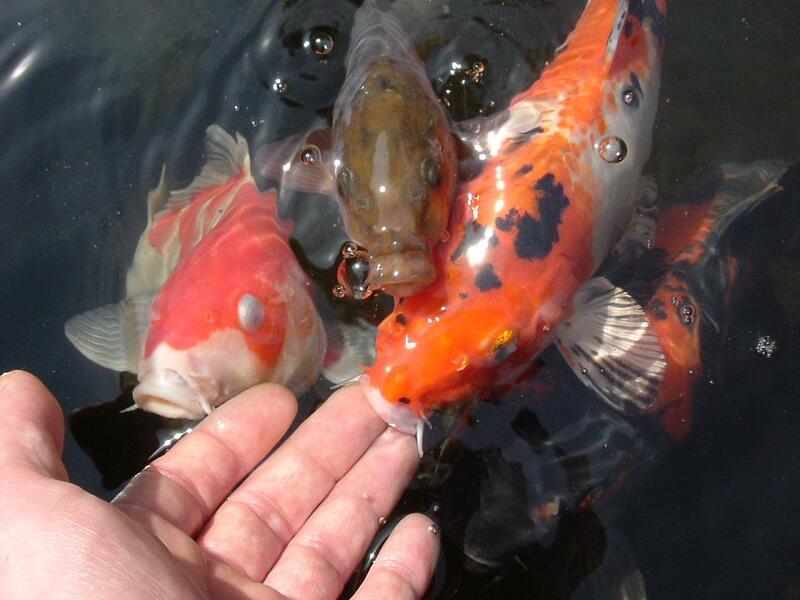 Fish being fed suddenly stop eating. 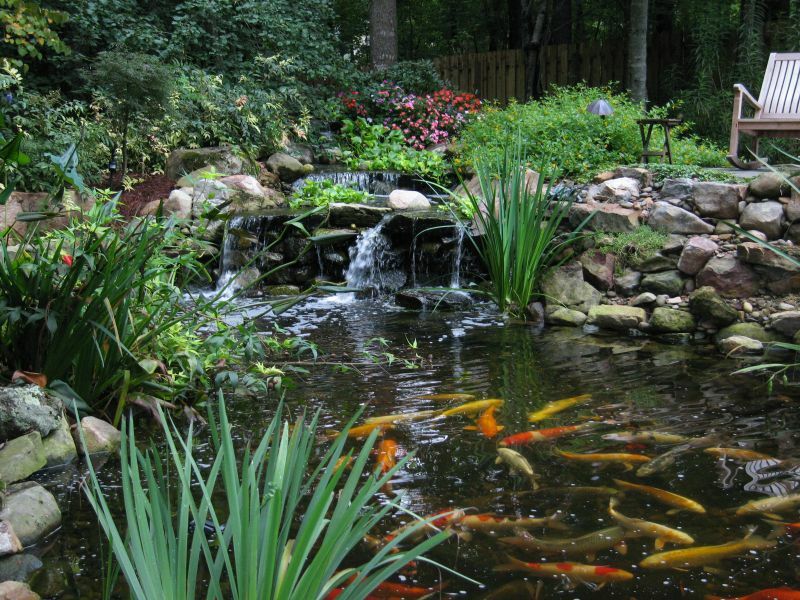 If your pond is filled with organic material at the bottom you could have even less time than you would expect. Methane gases build up in the bottom of the pond in the pond sludge turning your pond into a toxic mess. Pond cleaning should be one of your next priorities. 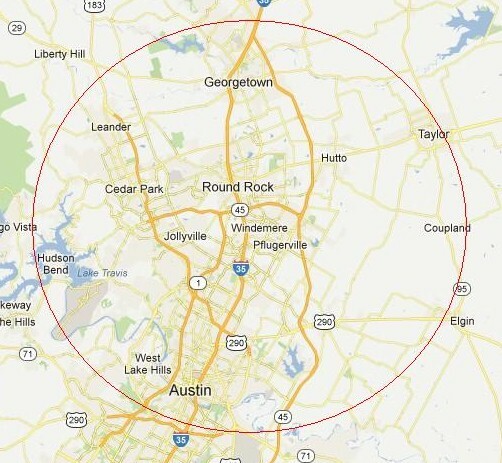 We provide this service for Austin and surrounding areas only A 25 mile circumference from Round Rock Texas. 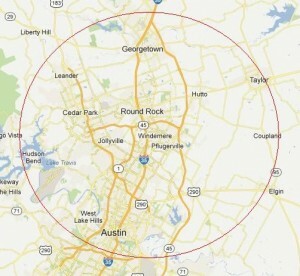 This is a map of the area covered for this service. The price for emergency services between the hours of 7:00 am to 7:00 pm is $70.00 . The price for this service between the hours of 7:00 pm to 1:00 am is $110.00 and the price for this service between the hours of 1:00 am to 4:00 am is $150.00. What do we do for emergency services is bring out a high output oxygen air diffuser to immediately add the necessary oxygen to supply life to the suffocating fish. 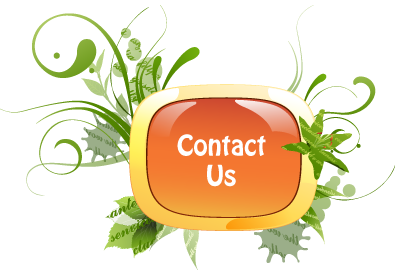 We can leave it on your property for up to 3 days until we can schedule your pump replacement. We can’t replace pumps on Sunday our pump facility is closed. There will be a $40.00 per day charge for use of the temporary air diffuser up to 2 days past the emergency call. So a total of 3 days maximum. Many times the pump goes out because the pond itself needs to be cleaned, the pump is clogged with fish poo or plants or both. We can save the day. 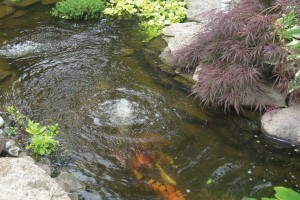 Fish and ponds are our passion and we will try and help to the best of out ability. Your fish will thank you for making that call.